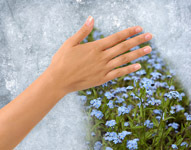 When skin or organs are damaged, the body naturally wants to heal itself. Since the body cannot re-create healthy skin or tissue, it puts together new fibers that are not as functional as the original tissue, but that serve as a protective, useful barrier. This is known as scarring. Scar tissue is the fibrous connective tissue which forms a scar. Although it takes the place of damaged or destroyed tissue, it is limited in function, including movement, circulation, and sensation. Physically, I have four visible scars from two different incidents. The first happened when I was five. While playing with my neighbor, she asked if I wanted to try her bike. It was an old bike, and getting the pedals going was not an easy feat. She asked if I wanted her to give me a push start, and though I said no, she decided that I still needed the push. I lost my balance and ended up on the ground. As my hand went out to catch myself, it found a nice pile of rocks. I don’t know if it was a rock or if there was glass mixed in, but I got a nasty cut on my hand. I walked back to my house and completely freaked my mom out. Even eight years later, when we sold that house, you could still see a trail of blood stains on the sidewalk leading to the door. My mom took me to my doctor & I ended up with a few stitches. The scar is hardly noticeable, but I know it’s there. And it reminds me of that incident, but it doesn’t dictate whether or not I ride a bike again. 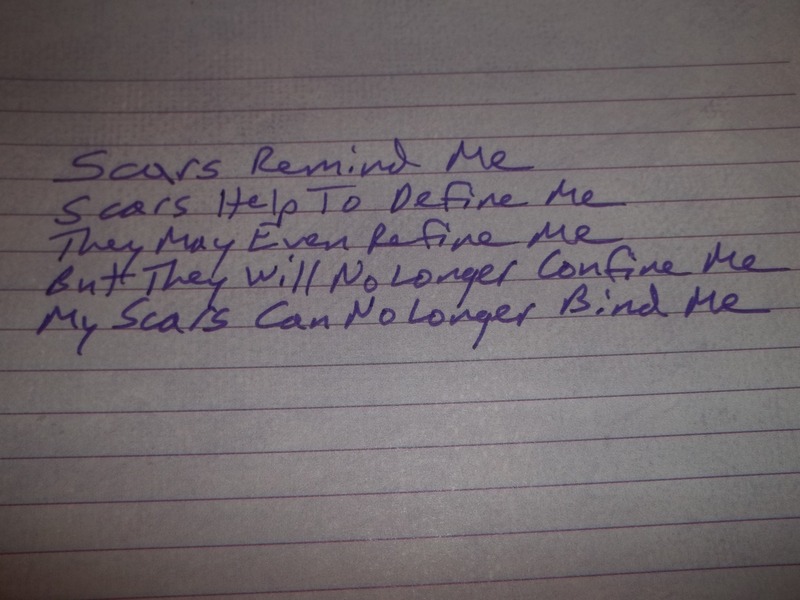 I’ve been thinking a lot about scar tissue lately. Not everyone has physical scars, but I believe everyone has emotional scars. Sometimes, we deal with them right away, and the scars closely mirror the original tissue it is replacing. Other times, we ignore the injury, and as the body tries to heal itself, sub par scar tissue forms. That scar tissue can be protective, but it is extremely less functional. My goal right now is to work to reduce some of the scar tissue to gain back some functionality – to allow my scars to remind me of where I’ve been but no longer dictate where I’m going. The voices that play in my head – the lies I’ve believed for so long – play a big part in that scar tissue. I learned quickly that I wasn’t good enough, and that voice has cost me a lot of functionality. It also protected me in some ways – kept me from taking risks that could further hurt me. Of course, those risks could have also led to wonderful results that I missed out on. Last week, there were a few things that happened at work to trigger those voices in my head. I felt that there were unrealistic expectations being placed on me, and I kept hearing that I wasn’t good enough. I quickly realized that the only person placing expectations on me was…well…me. I heard the voice, and I immediately reacted in my known/comfortable way. The voices, & my reactions to them, started out as a defense mechanism. Now they just hinder my ability to function the way God created me to function. Over the last few weeks, I’ve been thinking a lot about strength and confidence. I feel like I’ve developed a sense of strength and confidence that I’ve never had before. But what I’ve realized is that isn’t entirely true. That strength and confidence has always been there – I’ve just finally started to uncover it. And I’ve realized that there is more to uncover. Occasionally, I still get asked why I would go back to work in the same job that I was so eager to leave. They ask what’s different about the job. My response is always the same – nothing. I’m different. That, of course, raises another question. What’s different about me? My initial response has been that I have confidence now that I’ve never had before. But that’s not really true. That confidence has always been there. I can look back on my life and see glimpses – things I’ve done and decisions I’ve made that could never have happened if I didn’t have some sort of confidence or belief in myself. I know that I placed a lot more trust in other people, than in myself, but I also know certain things about myself that have allowed me to realize that the confidence has always been there. One thing I know about myself is that I’m a terrible liar, and I very rarely say anything without sending it through a very high grade filter – which means that I very rarely just blurt things out. I mean what I say. A few weeks ago, I was thinking about my journey, and I remembered the day that I turned in my letter of resignation. It hit me that I thought I had found my confidence after I left my job (continuing to develop as I went back to work), but I drew on that confidence before I ever left. I made the decision to quit on Monday. I wrote my letter of resignation that night, and I didn’t sleep very well, thinking about having to turn that letter in the next day. I sat at my desk that morning, trying to convince myself that I didn’t really need to quit that day. As much as I wanted out of my job, and as well as I knew that it was something I needed to do (even without knowing why), the thought of actually leaving was very difficult for me. I have an extreme amount of respect for my supervisor. I appreciated the trust she placed in me and my abilities. She always had my back. I knew the impact of leaving – at least to a certain extent. When I finally got myself to stand up from my desk that morning, I walked into her office, and the conversation was difficult but very good. I asked her if she had a minute, and I sat down. The first thing I said was, “You’re going to hate me.” That statement stuck out to me recently as I was recalling that conversation. If I had no confidence, I could have never made that statement. Only knowing that I was more than capable in my job could possibly have allowed me to believe that my leaving would have any impact at all. I definitely didn’t believe that it would have the impact that it actually had, but I knew there would be an impact. Since I’ve been back, I’ve also started to believe that I am a strong person. I’ve never thought of myself that way. I was sitting in my supervisor’s office a while ago, and she said something that took me by surprise. She was informing me of a conversation she had with someone I was struggling with. My supervisor told me that in the conversation she said, “If this would have been someone who isn’t as strong as Geri…” The rest of the sentence doesn’t matter. It threw me for a moment to know that my supervisor saw me as a strong person. Funny, though, when I related the story to another friend, she didn’t find it surprising at all. In fact, she loved that my supervisor saw that quality in me.